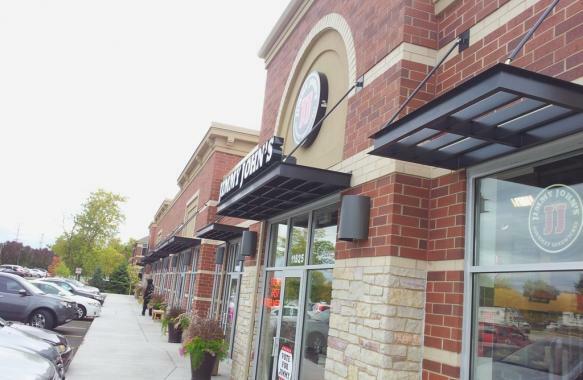 The Concord Development Company sought to construct a multi-unit retail building that required multiple canopies and sun shades to divert elements such as rain and melted snow away from building entry ways. Several other areas of the building also had to be protected, such as a fast food restaurant drive through. Our team met with them to better understand the specifics of the budget constraints and their spending comfort level and identify the best possible design and materials for that amount. The architect, Mayer Helminiak, LLC (MHA) specified a pre-fabricated canopy sun shade and brought us in. MHA discussed the look with us and we put together a plan for custom fabrication. The solution addressed MHA’s needs for integral drainage and gave them the look they were looking for. 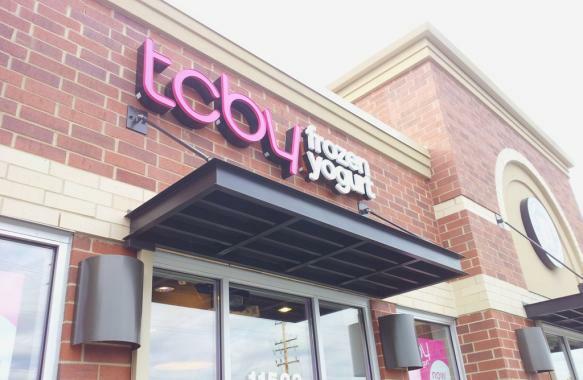 The material used was anodized aluminum with a PPG acrylic polyurethane top coat. It wasn’t a situation where the client said “here’s a drawing”. Some of the components of the project were sunshades; some were small roofs like the drive through. They all had to look alike. And one of the challenges was: how do you support the ones that were carrying the extra weight of the retailer’s signage? We helped solve these challenges and stay within the budget. Concord Development gave us a target date for installation and we made sure our work was done on time. We were there for both the pre-installation work and after that. We didn’t hold up the other trades.